Mitzvah literally means “commandment.” There are many mitzvot of conduct and observance in Jewish tradition. Bar means “son of” in ancient Aramaic, but in the this context means “responsible for.” Bat (“daughter of”) carries a similar meaning for girls. At age 13, a child becomes traditionally responsible to carry on a life guided by Jewish values and principles. However, fulfilling this role doesn’t happen all at once. Intellectual and spiritual maturity is a long, involved process, which takes time and experience. Bar/Bat Mitzvah is merely the symbolic beginning of this evolution. Ancient rabbinical sources state that it was at age 13 that a child began to acquire the faculty for sound reasoning and good judgment, as well as the ability to control his desires. It was at this age, according to the Midrash, a commentary on the Bible, that Abraham rejected the idols of his parents. It was also at age 13 that Jacob and Esau went their separate ways — Jacob to study Torah, Esau to worship idols. Current psychologists agree that at puberty, young people begin not only to understand themselves better, but also to understand what is expected of them by society. No doubt it is the family that feels the intensity of a Bar/Bat Mitzvah most of all, and at Temple Beth El we try to involve family members (including non-Jewish family members) in the service in a number of ways. But the event is also a community celebration as well, which is why at TBE we emphasize the communal aspect of the event. After all, the child is now announcing in a public forum, before his or her friends and neighbors, that he or she intends to carry on the traditions that we all hold dear. If this isn’t a cause for all to celebrate, then what is? Most important, of course, is the guest of honor him or herself. Through the student’s active participation in the service and through the Bar/Bat Mitzvah booklet that the student prepares, we all get to know this young adult as an individual with unique and special qualities all his or her own. Students are also expected to complete a Mitzvah Project. 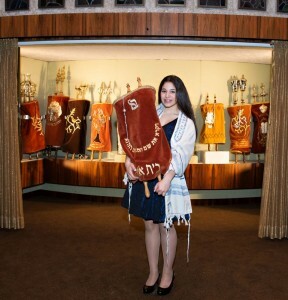 To learn more about the Bar/Bat Mitzvah in general, click here. If you have specific questions, please contact Rabbi Hammerman.